English Premier League chief Richard Scudamore has overseen a dramatic rise in television revenue. (CNN) -- Chelsea may be the new champions of England's Premier League but every club will be a winner next season. All 20 teams are due to receive up to $20 million extra thanks to improved television deals. The sale of the international rights has been particularly successful, doubling from $930 million to approximately $1.8 billion for the next three-year period. 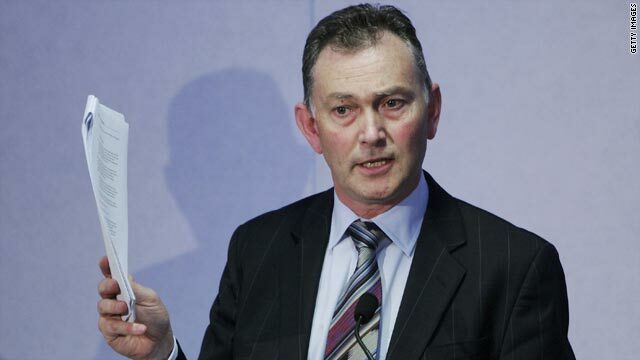 Against a backdrop of a global economic crisis, the increase is another feather in the cap of the league's chief executive Richard Scudamore. Speaking exclusively to CNN at the finals of the Premier League's Schools Tournament, Scudamore said: "We started going to market back in February 2009 and you'd have thought it would have been the toughest, toughest time. "In some ways it's not turned out like that but that's not just to do with football, that's also to do with television.... whilst hotels, restaurants and other businesses might have struggled, people stayed home and watched television. So our audiences are up, our TV rights are up." Scudamore sees the international market as the biggest growth area for the Premier League. He feels the global TV rights will eventually outstrip those for the UK alone. However, despite marketing the competition worldwide, his controversial plan for a 39th round of matches abroad will not be resurrected. "That was two or three years ago. Clearly, it withered on the vine of public opinion and it got a pretty decent slamming from a lot of people. "There's an argument that says new technologies and new ways of consuming audio/visual rights will probably take over -- you just wonder whether in three, five, seven years time its gonna be worth flying all over the world when you can recreate those experiences for people without actually leaving the confines of their home." Although the Barclays Premier League clubs have total revenues of more than $3 billion a year , their debts are estimated at nearly $4 billion and, this season, Portsmouth became the first Premier League club to ever enter administration. Scudamore is happy with the way the situation was handled, pointing out that new rules -- drafted before Portsmouth got into difficulties -- have now come into force to monitor club's finances more closely in future. Football has always gone and stretched itself, but it's manageable and there are so many clubs that are run very sensibly. "The bigger your revenues, the more your ability to borrow, the more therefore you put yourself at risk. Football has always gone and stretched itself, but it's manageable and there are so many clubs that are run very sensibly." Critics of the Premier League have used Portsmouth as an example of how the greed of England's top clubs has come back to bite them. But Scudamore says they are an "easy target" and he doesn't believe his organization's financial success has made them an enemy of governing bodies like the FA, UEFA and FIFA. "There's a media perception that we're all in the playground fighting and the reality is we're not. [Sepp Blatter and I] have a good relationship. "We have a laugh when we see each other. But he has his views, we have ours but we don't fall out about it and the fact is that neither of us get to do what we want to do on a given day anyway -- you've got a whole lot of stakeholders. Thank goodness nobody's got real power in football." Scudamore may play down his influence but plenty of the sports movers and shakers continue to take note of how he helps England's top 20 football clubs stay wealthier than any in the world.